HEAVY PARADISE, THE PARADISE OF MELODIC ROCK! 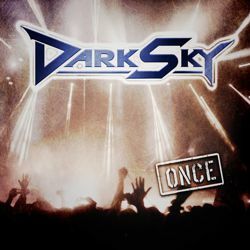 : METALAPOLIS RECORDS to release "Once" by DARK SKY on August 18th, 2018 on CD/DVD! Founded as a school band in Rottweil/Germany in the early 80’s, DARK SKY was on the international map in the mid 90’s for the first time with the debut album „Believe It“, which had big success in Asia, especially in Malaysia. 2002 saw the release of the second album „Edge Of Time“, which brought them on the map in their home country as well. It was followed by „Living & Dying“ and „Empty Faces“, which showed the band from their harder side without losing their trademark melodies. In 2012 they released „Initium“, a concept album, also produced (like the previous two) by producer Markus Teske (SYMPHONY X, VANDEN PLAS). Due to personal circumstances, DARK SKY were not able to tour with this album, but they played a few shows here and there. One of them was a support gig in their hometown for the Swedish superstars EUROPE. This show was filmed and recorded for the band’s first live CD and DVD. The DVD only contains the show, while the CDs was extended with 6 new studio tracks. One of them is a cover of the Pia Zadora classic „When the Rain Begins To Fall“. DARK SKY are better than ever and ready to hit the stage again. A tour as special guests for Swedish Melodic Rockers TREAT for November 2018 has been booked already!